How does one fully capture the essence of a never-before-attempted cycling tour in 350 words? Well, you really can't. So, at the risk of leaving out all the interesting details, here's what happened at Ride To Light 2016. Amidst the fanfare of Tezu’s Republic Day celebrations, Ride To Light 2016 – North East India’s first full-fledged cycle tour - was flagged-off by the DC of Lohit district, Arunachal Pradesh. Over the next 6 days, 8 riders supported by a crew of 20 people would try and conquer the 300 kilometers between Tezu (Lohit district) and Anini (Dibang Valley district); a feat never-before-attempted on cycles. The route covered the distance by passing through Mayodia – the highest point in Lower Dibang Valley district at an elevation of 2655m. Needless to say, the tour was challenging for the cyclists. Highly varying landscapes, tough roads, fast rising elevations, slush, snow and a host of other factors were enough to unsettle even the best. But none of that mattered when madcap laughter could be found just a pedal away. The humour, generosity and energy generated by this big group of diverse individuals was nothing short of phenomenal. The tour cycled an average of 6 hours a day, with scheduled stops for refreshments (provided by PRAN RFL and Redbull) and lunch. And after a hard day’s ride, the group would settle down at temporary campsites, accompanied by bonfire, hearty company, sumptuous tribal cuisine and copious amounts of the local rice beer – ‘yu-chi’. On day 6, the team was received at their destination - Anini - by the DC of Dibang Valley district. Their achievement was felicitated the following day at the village with the team part-taking in the local Reh festivities, which had been advanced a whole day to accommodate for the visitors. 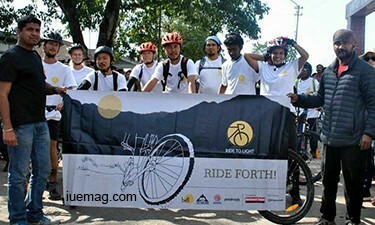 RTL was organized in partnership between The Batti Project, Cycle Tours India and Tine Mena (North East India’s first woman Everester). Devised by Batti, Ride To Light’s purpose is to engage a growing cycling community and enlist their help in raising funds to light up remote off-grid villages in North East India with sustainable energy solutions. Merwyn Coutinho and Rajiv Rathod, co-founders of Batti, say “Ride To Light, while a novel event, is just one in a series of innovative fundraising techniques we’re developing to support the Batti Project”. Based on the reception of RTL, all we can say is, we’re interested to see what they’ll conjure up next. Any facts, figures or references stated here are made by the author & don't reflect the endorsement of iU at all times unless otherwise drafted by official staff at iU. This article was first published here on 16th June 2016.